Pierre Boda has his sister’s birthday party at a Sydney ice rink to thank for his start at in short track speed skater in early 2000. He took to ice skating very quickly and saw a speed skater on his very first day on the ice and knew that’s what he wanted to do. Boda competed at his first Junior World Championships in 2009 in Canada. Two years later, he was Australia's leading performer at the 2011 Junior World Championships in Courmayeur, Italy, placing 10th in the men's 1500m event. In 2011 he competed in his first Senior World Championship in Sheffield, Great Britain, whilst still eligible for Junior Worlds for another two years. During these early years Boda’s then best World Cup performance came in 2012, where he finished 12th in the 1000m in Shanghai, China. At the 2013 Junior World Championships in Warsaw, Poland, Boda impressed with a 13th in the 1000m. He also placed 19th in the 500m and 29th in the 1500m. He went on to compete at the 2013 World Championships in Debrecen, Hungary where he was 28th in the 500m, 24th in the 1000m, 30th in the 1500m - 27th overall. The 2013-2014 season was a memorable one for Boda, making his Olympic debut in Sochi, Russia, and also recording a personal best result in the 500m at the 2014 World Championships in Montreal, Canada. In 2014-2015, Boda posted a number of top-20 performances on World Cup in his favoured distances of 500m, 1000m and 1500m, highlighted by a 13th place finish in the 1000 metres in Seoul, Korea and a World Cup best in Shanghai, China, finishing in seventh place in the 1000m. The 2016/17 season saw a return to the top ten in the 1000m World Cup at the Olympic Test event in Gangneug, South Korea and a top 20 at the same distance in Salt Lake City, USA. He is currently living full-time in Korea near Seoul, training for the season ahead to qualify PyeongChang 2018. I began my sport in 2000 because growing up I always did a lot of roller blade and one day my grandparents were looking for a place for my sister to have her birthday party. We were in Sydney and Macquarie Ice Rink had an ad for birthday party and that was the first time I ever skated. I picked it up pretty quickly. Someone was speed skating and I wanted to do that, so started lessons at Canterbury Ice Rink. When I am not training or competing I am relaxing and taking photos. Bought a camera a year ago. I enjoy short track because it’s different too any other sport I’ve ever done. 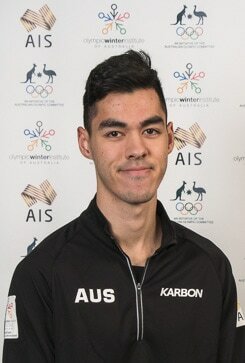 Growing up in Australia everyone does the expected sports, cricket, life saving, footy etc but when I tried ice skating I found it was so different and a challenge. Not just running in a straight line. There are so many other aspects to short track. Education: Deferred uni course in Business Finance and currently doing a real estate course. Favourite international competition: The Netherlands because they turned our comp into a show and do everything for the spectators …. Including music and DJs, lightshow. Childhood Ambition: Always wanted to be a sporting hero because I looked up to so many athletes in so many different sport. I wanted to be a role model too.